U.S. defense officials said the movements are being watched closely as China’s military is also holding large-scale military exercises that some fear could be a trigger for a conflict with Japan that could involve U.S. forces. 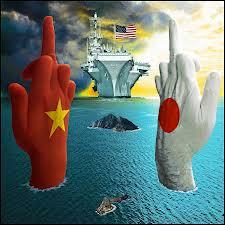 …The People’s Liberation Army Second Artillery Corps, which operates missile units, were preparing to target the disputed Senkaku Islands as well as U.S. military bases in Okinawa. The fact that the upstart Washington Free Beacon is focusing on this suggests America’s right may be discovering the multi-faceted China Challenge. One question: What took you so long, guys? Good that America’s right, short a cause or two, are looking past Iran and the problems of the Middle East to notice the long term strategic challenger rising in the Far East. Could this be something that galvanizes them and gives them an issue they can run with in US politics? Too early to say. If Washington isn’t comfortable with a more powerful China demanding a greater say over Asian security issues, making China wealthier by trading with it doesn’t make much sense. Very good question. A very good question indeed. I suppose it could form the basis of a lot of American political thinking in the years ahead. A wise Republican would spend some time considering this question and see what he comes up with. I’d be very eager to speak to these kinds of Republicans. To see these Republicans. To hear their ideas.